Any trainer who goes out side the conventional methodology of training, i.e. Olympic, Circuit, Barbell/Dumbbell, etc. and combines a series of exercises together that has the client change elevation, plains of motion, integrates core stabilization, strength/power/ speed/agility/endurance, recruits more than one muscle simultaneously while conditioning them for everyday life/ work IS FUNCTIONAL TRAINING! Let me tell you who has this “functional” thing down-the Crossfit people! Their “WOD’s” or Workout of the Day are intense, fun, creative, never the same or boring, consistently push you past the day or week before, named after heroes, troops, chicks, dudes, hurricanes and more! Want to get out of the box? Your own and the gym? Find your local Crossfit and have fun! Be warned, it’s addicting! I’m going to focus on #2. 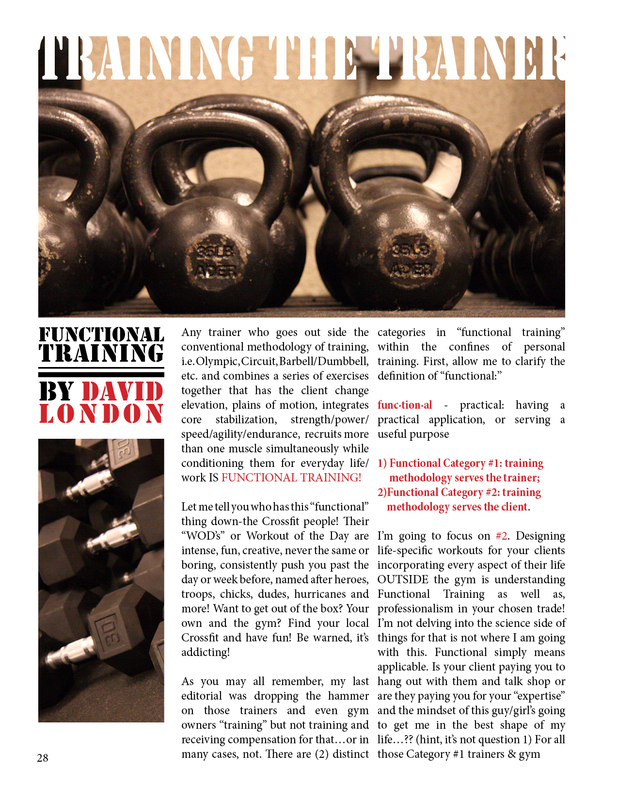 Designing life-specific workouts for your clients incorporating every aspect of their life OUTSIDE the gym is understanding Functional Training as well as, professionalism in your chosen trade! I’m not delving into the science side of things for that is not where I am going with this. Functional simply means applicable. Is your client paying you to hang out with them and talk shop or are they paying you for your “expertise” and the mindset of this guy/girl’s going to get me in the best shape of my life…?? (hint, it’s not question 1) For all those Category #1 trainers & gymowners…STOP STEALING FROM YOUR CLIENTS AND MEMBERS! Deliver on the promise! in great shape(you better not be an out of shape trainer! ), enjoy coming to work/sessions and be very marketable…learn Crossfit. It is a great tool to have in your PT tool kit as it truly makes you well- rounded. Do yourself a favor and contact a Crossfit in your area or go with one of your friends. We all know at least one crazy-crossfitter! Down here in Lacey, I work for Anytime Fitness as an Area Fitness Manager. The ownership group has (3) gorgeous, non-box style fitness centers that is not only a trainers dream as it does not have any of the usual gym/corporate who- ha, but has all the fun stuff-tires, sledge hammers, speed/heavy bags, med balls, plyo gear, bands, balls, ropes, db’s to 130#’s, killer cardio w/ tvs, smoothie bars, massage, tanning, classes, showers, saunas and more! The clubs are 24/7 so it’s never crowded and I can train clients anytime to accommodate their schedule! A trainer’s dream! You have zero restrictions on how you train a client! What? Makes for a fun, creative and rewarding work environment…are you creating the same for yourself/your gym?? Be a trainer-not a banker!